Mr. Bostridge has been singing “Winterreise” for three decades. 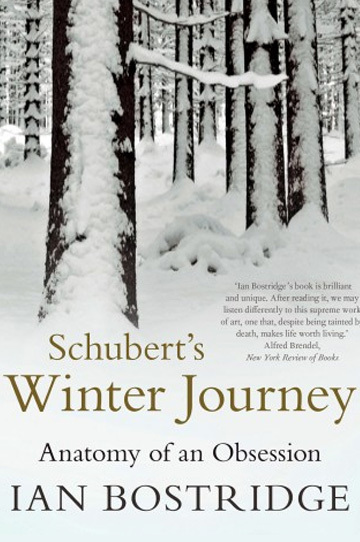 He has also made a film about it and discussed it in lectures, and now he has written “Schubert’s Winter Journey: Anatomy of an Obsession.” A former scholar with a background in the humanities, Mr. Bostridge currently teaches at Oxford and is well-positioned to undertake such a study. “Schubert’s Winter Journey” is an unusual and compelling book: Omnivorous and digressive, it captures the enduring mystery of this seminal work in the lieder tradition. Readers who love “Winterreise” will find the book a rare treat, and those who do not yet know the piece have here a fine companion as they listen. In this age of faceless MP3 files, this handsome volume may be thought of as a luxurious set of liner notes. The wanderer is Schubert’s avatar, though we do not know precisely what has happened to him. Early songs in “Winterreise” speak of a girl, a “rich bride,” who “talked of love / the mother even of marriage.” We see the wanderer in a wintry landscape, remembering past happiness or possibility, defiantly turning away, faltering, raging. As the cycle progresses he leaves all this behind and journeys into the void. Eventually he reaches the cemetery’s gate in a song “as somber and intimate as art can manage.” As Mr. Bostridge writes, these experiences may echo Schubert’s own infatuation with a wealthy music pupil, a Viennese countess who would never have considered marrying so far beneath her. Schubert was one of the first composers compelled to scrape together a living without the protective employment of a patron. He visited brothels and hung out in coffee shops. In short, he was no catch. Schubert once said that “pain sharpens the understanding and strengthens the mind.” “Winterreise” is the proof. It is a remarkably cohesive work for such a large collection of songs: proportionally structured, varied in dynamic and design yet unified throughout. Schubert had an extraordinary ability, Mr. Bostridge observes, to pivot from the work’s prevailing minor tonality to the major and somehow make it sound even sadder. “Winterreise” is universally acknowledged as a masterpiece, the rare song collection that is performed whole rather than cannibalized for hits and comprising in itself an entire concert program. Mr. Bostridge’s book explores the cultural history of “Winterreise” more than the work’s musical structure. He pays due homage to Schubert’s modern champion, the recently departed German baritone Dietrich Fischer-Dieskau, and addresses some of the controversies in recent Schubert scholarship. Was the composer gay? Mr. Bostridge thinks not—he was too interested in women. Should “Winterreise” be performed by a baritone or a tenor? The author unsurprisingly prefers tenors, although the piece’s many descending vocal lines land perfectly in the rich middle of the baritone register, as an exceptional recording by Florian Boesch in 2011 makes clear. Mr. Bostridge’s mastery of the music and the text is evident throughout. Between such observations and biographical interludes, Mr. Bostridge takes the reader on a tour of “Winterreise” esoterica. His interests tend toward the literary; hence he touches on topical German giants like Goethe and Thomas Mann but also ranges wider, to Proust and J.M. Coetzee. A chapter on “The Crow” explores that bird’s symbolism in Alfred Hitchcock’s films and Caspar David Friedrich’s paintings. The chapter on “On the River,” a mordant song about a frozen stream, begins delightfully thus: “During the early nineteenth century rivers of ice, in the sublime form of Alpine glaciers, were a subject of enormous interest to the European intellectual world.” It must be said that some of these explorations are more engaging than others. But then again, storytelling helps pass the time on a journey, and Mr. Bostridge employs a lively, inquisitive tone that is easy to like. “Schubert’s Winter Journey” is at its best when the author elucidates “Winterreise” with the insights of a performer. He writes that in recitals, unlike operas, the lights are not as bright and the singer can see and interact with audience members—an advantage for so expressive and communicative a performer as Mr. Bostridge. One evening he disconcertingly noticed a celebrated pianist following along with the score and reacting violently—shaking his head, turning to his companion—over an interpretative decision (whether to match a dotted eighth note in the left hand of the piano with the triplet above). There is the question of momentum: whether to take an intermission (perhaps) or perform an encore (never) and how long to linger between songs. Fascinatingly, Mr. Bostridge has a superstitious aversion to rehearsing “The Hurdy-Gurdy Man,” a repetitive, “speaking” song that seems to him closer to Bob Dylan than Schumann or Brahms. A risk taker, Mr. Bostridge encourages his pianist partner to select a key for it as the mood strikes.